To say Sunday's contest against the San Francisco Giants was ugly would be an understatement, but a Phillies lineup anchored by Odubel Herrera and Maikel Franco led the club to a 9-7 victory at Citizens Bank Park. That's right, Herrera and Franco. 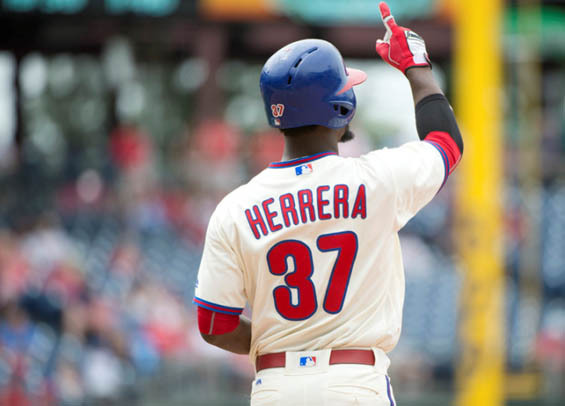 Herrera lashed a pair of doubles and a home run en route to collecting three RBI while Maikel Franco broke a 7-7 tie in the eighth inning with a solo shot to center. Both players put the ball in play every at-bat. "Odubel swung the bat much better and looks much more disciplined," said Phillies manager Pete Mackanin. "Franco looked good up there too, he had an approach and it worked." The win gave the Phillies back-to-back victories for the first time since a six-game winning streak from April 20-27 and also averted an 11th straight series loss, a mark the Phillies haven't reached since 1941. "Good to win a series for a change," Mackanin said. "It's really uplifting for the team. Yesterday was a good game that I was hoping would spark us for today and it sure did." Freddy Galvis also played a pivotal role at the plate, becoming the first Phillies' player since Jimmy Rollins in 2011 to belt a homer from both sides of the plate. "Two good swings and I hit the ball really good," Galvis said. "I think the offense is putting stuff together right now, we just need to keep working and going out there as a team." The afternoon, however, belonged to Herrera and what appears to be his reemergence as an important cog in the Phillies offense. Over the final two games of the series with the Giants he collected five hits, all for extra bases. "Looking to take an approach at the plate and going up there with a plan," Herrera said of his recent success. "I know what I'm supposed to do and I know what I need to do better, so I just need to continue to be patient and stay positive. I'm trying to be more selective and disciplined up there right now while letting the pitcher throw his pitches until I find one that I like." Jeremy Hellickson labored for the Phillies, tossing 103 pitches over 5 1/3 innings. He surrendered five runs (three earned) on four hits and four walks. Including Sunday, he's surrendered 10 walks, four homers, and 18 hits over his last three starts. "Command just hasn't been there," Hellickson said. "I need to do a better job of avoiding the walks and the homers." The Phillies embark on a nine-game road trip beginning Monday with a four-game set in Atlanta. The trip concludes with stops in St. Louis and Boston before the club returns to Philadelphia next Wednesday. "Hopefully today's offense carries into our series in Atlanta," Mackanin said. "It's good to leave here on a high note." Brock Stassi was optioned to Double-A Reading following Sunday's game. Mackanin said the move is an effort to get him more at-bats. In 35 games with the Phillies he's amassed just 69 plate appearances while hitting .197. The move also opens a spot on the 25-man roster for Monday's starting pitcher Nick Pivetta.